Welcome to my home! I have to be honest with you, every time I post a tour of my home I get so nervous. I love my home but to be honest its perfectly imperfect. There are lots of things I would change but I am embracing it as it is right now! It’s a starter home and its a perfect starter home for our little family. I feel inadequate a lot of times because I tend to compare my home with many other bloggers that have extremely beautiful homes. So my words for everyone today is to try not to compare our homes to each other but embrace the homes we have and make the most of them! I love to decorate because no matter where I have lived I have been able to create a place that I love and that I am comfortable in. So this home tour I hope to give you some ideas and inspire you. I don’t hope for you to compare your home with mine at all. If you have been following us throughout the Christmas season some of these areas in my house you have probably already seen. 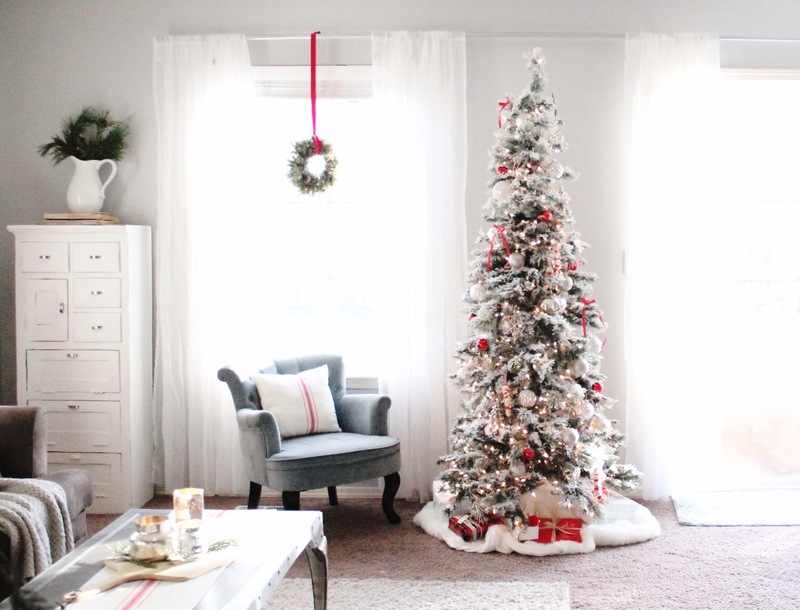 Sorry for the repeat but here are all the Christmas touches that I have added to our home. Welcome to the entryway! I made this corbel shelf early this year and absolutely love the touch of vintage that it brings into my house. I made this wreath using the tutorial here. I then have my shelf styled with neutral decor and vintage ornaments. We also added a few trees to the entryway along with a basket filled with a blanket and pillow. Here are some close ups of details in the entryway. Next we have our kitchen. The kitchen is the first thing you see when you walk into our house. Actually the wall opposite of the corbel shelf is my kitchen. We have a wall that leads into the kitchen that is about three feet wide. I have this chalkboard that fits perfectly on this wall. Every season I try to switch the chalkboard up. Our kitchen includes our dining area as well. Its a small space but it works! To add some Christmas to our shelves I added some greenery to my pitcher and a couple of pomagranits. I love how nature can add the simple touches of Christmas. On the table I added a swag of greenery that I got at Trader Joes. Trader Joes seriously has the best greenery and flowers. I then set up my gingerbread village on my two cake stands. The cake stands and the gingerbread village are all from World Market. I had a lot of fun decorating these little gingerbread houses while Maylee was napping. The trees that are on the cake stands were originally green. I dipped them in bleach for about 5 min and they came out this beautiful cream color. I love them. I then dusted the whole thing with powdered sugar creating the snow effect. Here is part of my actual kitchen. I placed my gingerbread house in the corner. You can find the tutorial on how to make that here. I had to move it to a higher place so Maylee wouldn’t eat it or break it. Some other Christmas touches I added are more pomegranates, a red and white dish towel, and a bottle filled with greenery from the yard. PS I am hoping Santa brings me knew countertops for Christmas (hint hint). Our kitchen looks into our living room. Thats what I loved most about this house. I loved that the kitchen and the living room were right there together. One of the first things you see in the living room is this table with my large glass containers on it. I filled them with greenery and added a few fun ornaments. Behind the greenery you can see our advent calendar on our gallery wall. I love how it flows with the gallery wall. To even the gallery wall out I added our stockings on the other side. A little story about our stockings. For mine and Justin’s first Christmas I wanted to buy some stockings from Anthropologie that I LOVED. But we were poor and they were $50 a piece. I then decided to make my own! They turned out very similar to the Anthro ones and we love them. I still haven’t made May a matching one so she has the mismatched stocking in the middle. Again I added more greenery in the white pitcher. Can’t go wrong with greenery during Christmas time. I filled the couch with pillows, much to my husbands dismay. 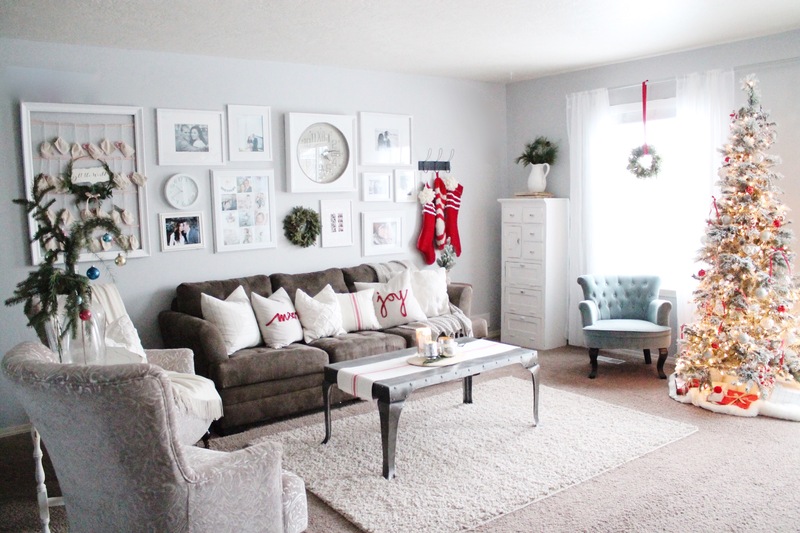 I used our cream and white pillows we use all year long and added a few Christmas ones in. I made the Merry and Joy pillows. They were quick and easy. I hope to get a DIY post up on how to do them by next week. On the Coffee Table I added a red and white runner and a pizza board. On the pizza board I added more greenery and three candles. I love these three candles together! One is Volcano from Anthropologie(My favorite candle) and the other two are Christmas tree scents. I found those at TJMaxx. Our tree is placed in between our window and sliding door. Its a perfect little space for it. I flocked our tree this year. You can find how I flocked it here. It was a thrifted tree for $25. Steal of a deal for a flocked tree I would have to say. Ive been slowly wrapping gifts. This year I am wrapping them with red, white, and black. I love to wrap and make the presents look pretty. On the other side of the living room we have the not so pretty TV. I added another advent banner and some more greenery. I am hoping to get a shelf added above our tv so we don’t have that weird open space there. In our bedroom I draped a red throw on the end of our bed. I then placed a tray filled with things to make hot cocoa. on both our night stands I filled glass bottles with tree clippings. I then draped a greenery swag across the window. I still need to get the curtains hung in this room. When my husband came home and saw that tray he was sooooo excited. He loves hot chocolate. He has had many cups of hot chocolate in bed since I added this little tray. Well those are all the touches of Christmas that I have added to our home. I hope you enjoyed and got some fun ideas of things to add to your home. Have a Merry Christmas! Your house is so beautiful! I love your simple color palette, it really looks so relaxing! Where did you get your throw in your bedroom? I love it! Love your sweet home it truly is so beautiful! I am very inspired!! You have a beautiful home! I adore your style! Thank you! I’m gonna try to get hat up as soon as possible!